Meera Menezes moves from one booth to another at the India Art Fair in Delhi. A bumblebee stood transfixed by a twisted loop of large glass spheres. Viewed from different angles, they alternated between looking green and transparent. 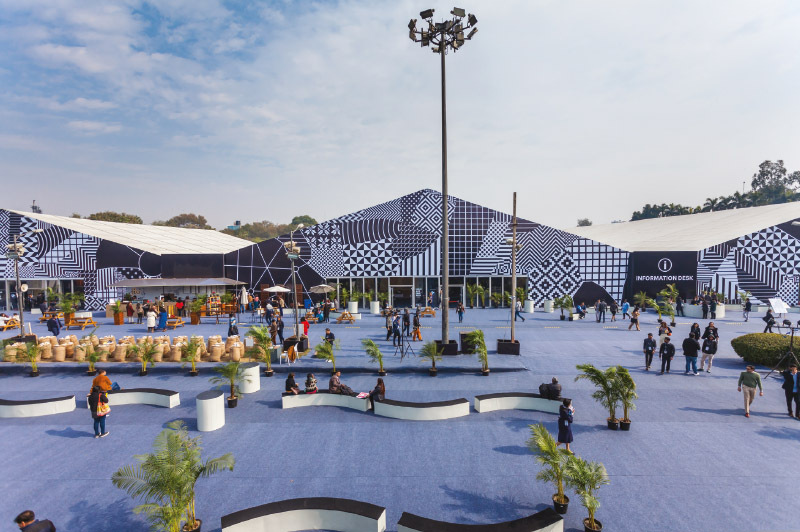 The work, Olafur Eliasson’s Continued infinite conversation, was one of the showstoppers at the Berlin-based gallery neugerriemschneider’s booth at the India Art Fair (IAF). Meanwhile, the person dressed as the bumblebee turned to offer me a tiny envelope. In it lay a ‘bee manifesto’, the last lines of which read, “Bee aware, there is no land of milk and honey, there’s no future, where bees die,” drawing attention to the alarming extinction of insects on the planet and the imminent collapse of nature’s ecosystems. A sobering note on which to begin my tour of the art fair! The 11th edition of the IAF, mounted by the Director Jagdip Jagpal and her team from the 1st to the 3rd of February, brought together 75 galleries and contemporary art institutions from India and abroad. neugerriemschneider was a first-time participant at the IAF and had on display works by several well-known artists including a reclining figure by Polish artist Pawel Althamer and a porcelain vase by Chinese artist Ai Weiwei. Other first time entrants from abroad included Japan’s Sokyo Gallery and Korea’s Arario Gallery, the latter showcasing Nalini Malani’s Instagram animations created on her iPad as well as an array of Tallur LN’s sculptures that offered droll juxtapositions of classical Indian sculptural elements with grinning skeletons. Olafur Eliasson. Continued Infinite Conversation. 2017. Photograph by Jeetin Sharma. © India Art Fair. Some of the returning international galleries included the Lukas Feichtner Galerie, Aicon Gallery, Blain/Southern, 1×1 Art Gallery and the blue-chip David Zwirner. While Galeria Joan Gaspar – a regular at the fair for several years now – showcased classical masters such as Picasso and Miro, Zwirner’s quiet booth was an oasis amidst the clamour of artworks at the fair. On display were some exquisite minimal works including Fred Sandback’s drawing in space, Josef Albers’ Study for Homage to the Square and Dan Flavin’s light installation. The gallery’s director James Green stated, “We have built on our experience of last year’s fair, working hard during the year to build relationships with collectors here and this has really paid off. Sales have been strong. We have placed a Yayoi Kusama Infinity Net painting with a major Indian collector, as well as a range of artists who are new to the Indian market including Wolfgang Tillmans, Thomas Ruff and Harold Ancart.” Prateek Raja of Experimenter, Kolkata, concurred, “The collector base has widened and is growing steadily over the years… I see a lot of them making very sensible, ambitious decisions”. This year the facade of the art fair halls got a makeover by the graphic designer and street artist @thebigfatminimalist. The striking black and white imagery was reportedly inspired by the topography and roadmaps of Delhi. The layout of the fair has improved with each passing year with solo presentations by artists offering welcome relief in a time of retinal distraction. Among them were Jitish Kallat’s large canvases, Dayanita Singh’s evocative photographs in Night Seen, Sumakshi Singh’s delicate lace-like creations and Priya Ravish Mehra’s paper pulp and thread works that adorned a wall at the back of one of the halls. Other works which managed to hold their own despite the visual bombardment included Mrinalini Mukherjee’s large, three-panel drawing and Meera Mukherjee’s bronze at the DAG booth, Mithu Sen’s self-censored two-panel work and Yardena Kurulkar’s prints made from a 3D recreation of her heart titled Fall of the Buckler at the Chemould Prescott Road stall, Nasreen Mohamedi and Nikhil Chopra’s drawings at the Chatterjee and Lal booth, Zarina’s delightful rubbing from woodcut titled A few steps in the land of Confucius at the Gallery Espace booth, Aji V.N.’s haunting paintings and Manish Nai’s compressed book columns at the Galerie Mirchandani + Steinruecke display. Strategically located between the gallery halls and the project space was Manisha Gera Baswani’s Postcards from Home, which held stories of Indian and Pakistani artists whose families migrated in the wake of Partition. 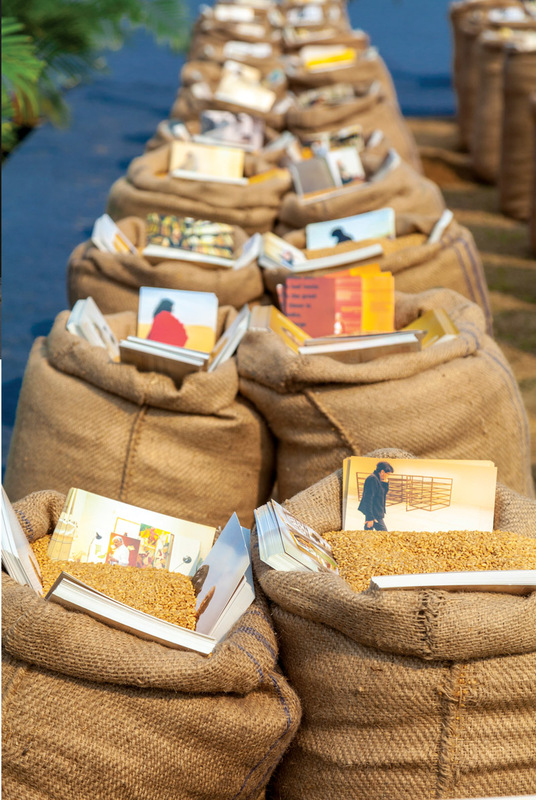 The postcards, which were stuck in sacks of wheat, could be taken away and drew a number of visitors who recounted their own family histories of displacement to the artist. In the centre of the hall that housed the artists’ projects was Madhusudhanan’s immersive two-channel video installation, Light House, which put the focus on the plight of Adivasis in Kerala. Nearby was Sohrab Hura’s disturbing yet addictive video, Lost Head & The Bird, with its frenzied splicing together of photographs and file footage of communal riots, hate speech by right-wing activists, Bollywood film stills and WhatsApp videos. Next door, Baaraan Ijlal’s sound installation Change Room offered visitors the chance to listen to the narratives of people who had experienced violence in any form and in turn to record their own stories anonymously. The Forum played host to a series of talks, which ranged from the future of photography to curating under pressure. There were discussions with artists, gallerists, collectors and curators, notable among them the conversation between Jitish Kallat and Adam Szymczyk, Artistic Director of the recently concluded documenta14, on Kallat’s practice and recently launched monograph. The first definitive book on Gulammohammed Sheikh also afforded the opportunity for the interlocutor, the art historian Kavita Singh, to engage in a dialogue with the artist, who regaled the audience with several anecdotes. India Art Fair 2019. Photograph by Jeetin Sharma. © India Art Fair. Outside the Forum there was a space for performances supported by ART India. 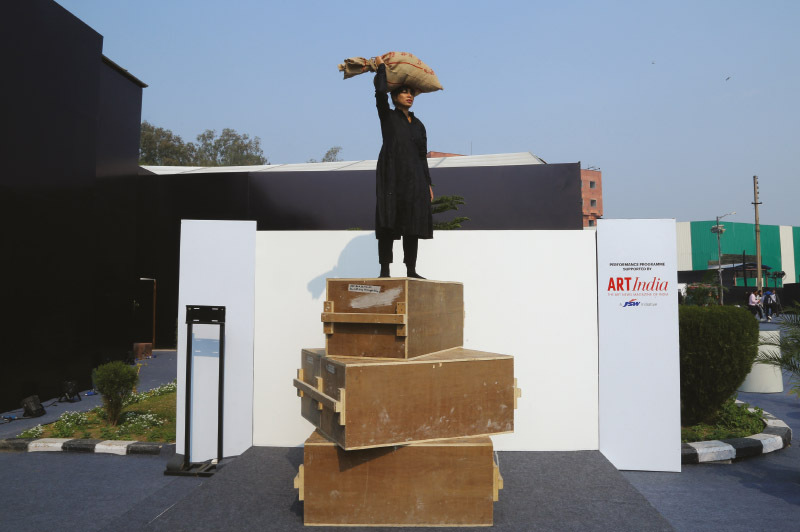 In a powerful and intense durational performance, Yasmin Jahan Nupur carried a heavy jute sack filled with all manner of grains, recalling the plight of refugees and migrants, who often flee with just the clothes on their backs and some meagre belongings. Other performances included Sahej Rahal’s bhramana 7, Amol K. Patil’s Take the City and Mithu Sen’s 100 Silent Ways. Sen had also staged a performance a day before the opening of the fair at the home of Shalini Passi, founder of the Shalini Passi Art Foundation, quirkily titled The Lunch is Cancelled. Yasmin Jahan Nupur. Word and Hopes. 2017. Performance programme supported by ART India and curated by Sitara Chowfla. Photo credit Gulshan Sachdeva. © India Art Fair. While the performances served to create a buzz among the general public, at the end of the day the fair is about generating sales. Thomas Erben who decided this year to go in for a joint solo booth of Aditi Singh’s ink creations with Chemould Prescott Road, confided that they had sold out the booth save for a small work. Equally gung ho was Harry Hutchison, Director of Aicon Art, New York, who stated, “We’ve had notable sales for works by Rasheed Araeen, Salman Toor, Priya Ravish Mehra and Nataraj Sharma alongside institutional interest from the region and abroad. We very much look forward to returning next year.” Lukas Feichtner, who showed renowned Austrian artist Hermann Nitsch’s works, mentioned that while he had excellent sales three years ago, this year he was “satisfied,” adding that the fair needed to be more proactive in bringing collectors to the international galleries. Manisha Gera Baswani. Postcards from Home. 2017. Photo credit Jeetin Sharma. © India Art Fair. In the earlier editions, media partners were given separate stalls outside the Forum; this time, in an act that seemed high-handed and dismissive, all the magazines were herded together in one booth near the bookstore and the crowded café! 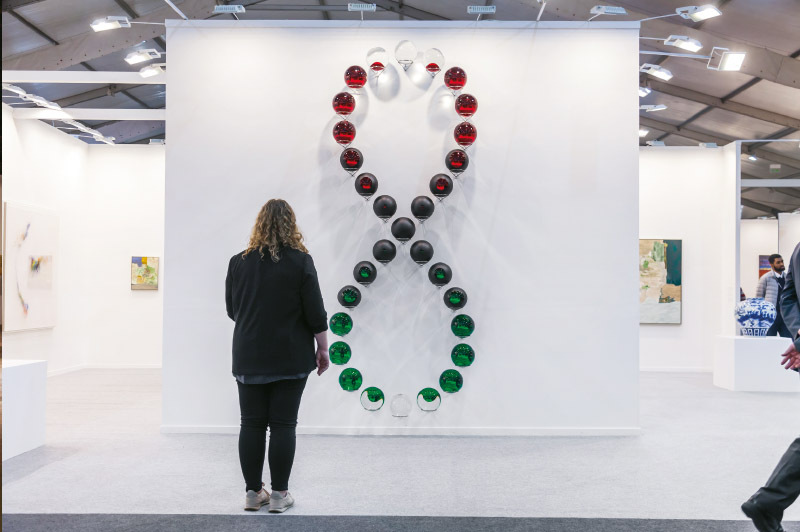 Meanwhile, the fair is likely to see a change in ownership with the MCH group having announced its intention in November to sell its shareholdings in Art Düsseldorf and the India Art Fair. But if all goes well, the 12th edition of the fair will take place from the 30th January to the 2nd of February 2020 at the NSIC grounds in Delhi.